As a company, sometimes it’s nice to take a look back at how far you have come. 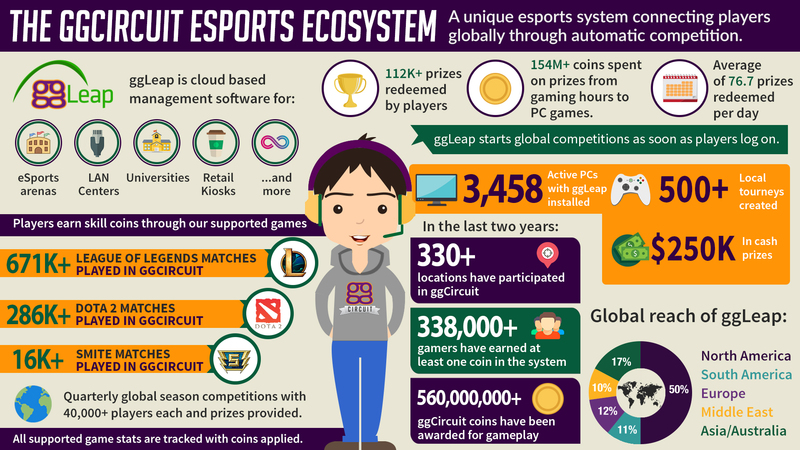 The ggCircuit esports ecosystem infographic below was created to help us understand where ggCircuit has came from, where ggCircuit is at, and what the future might hold. Some really interesting numbers came out of doing this project. These numbers are accurate as of December 1st. This infographic will be updated over time as things are constantly changing. The ggCircuit ecosystem consists of many pieces that all work as one. Through ggLeap, global gaming locations utilize our software to manage their businesses. Once a business starts a subscription, they receive their own cloud based server. The locations install the ggLeap client on all of their PC machines and through security credentials it automatically connects to their cloud server. ggCircuit is a service that is always running. Customers earn coins through hourly and skill based play. Skill based play allows a user to connect a game account that ggCircuit support and also earn coins based on what they do in game. ggCircuit also allows a business to create local tournament, and create their own prize vaults. ggLeap/ggCircuit also assists in creating nationwide and global competitions for locations to participate in. Our company also provides global prizes in a prize vault at no extra cost to the location. For ggLeap, many location opportunities open up because our software is so portable. Obviously, LAN centers and esports arenas are our core customer. However ggLeap is starting to see a growing customer base with colleges and universities that provide either an esports center for their scholarship players or a social gaming entertainment experience for both students and the public. ggLeap also has already worked with corporations such as Dell/Alienware to provide custom kiosks in retail stores. A key statistic to evaluate is that ggLeap is closing in on 4,000 active PC screens globally. These are PCs that have been connected to our system within the last week. 4,000 screens pointed directly at the esports demographic that is engaged and ready to play. As locations and ggLeap subscriptions continue to increase, so does this number. Over 330+ locations have participated in ggCircuit, with 338,000+ gamers earning at least one coin within the system. Our coin based reward system has grown to over 560 million coins that players use to redeem prizes either locally or globally and is the basis for our automated esports competition system. With the utilization of cloud services, our software is very easy to distribute. There is not need to have a server in your location running ggLeap. This detail allows big savings to any center in hardware costs. On top of that at the Pro level, selected games are provided (more savings), and an automated competition system with tournament abilities. Thus saving more money and time for a business owner. The majority of our centers are within the US (50%), then distributed close to equally in Europe, South America, Middle East and Asia/Australia. Currently ggCircuit supports League of Legends, Dota 2 & Smite. The ggLeap development team has already done work on some game integrations in the future and have plans to implement those in 2018. They will continue to work with game APIs and game developers to provide more opportunities for gamers to track their stats and earn skill coins within our system.